Just 60 kilometres west of Hong Kong, Macau is an exquisite melting pot of European and Chinese cultures. With a plethora of attractions ranging from historical architecture to dazzling casino strips, Macau’s well-preserved landmarks, delicious culinary combinations and high-end living attracts visitors from around the world. Popular attractions include Macau Tower, A-Ma Temple and The Venetian Macao. Cheap flights to Macau are now available for a limited period of time, so get ready to be dazzled by the cultural fusion and cosmopolitan living of this fascinating city! Macau is home to Macau International Airport (MFM), located on a 20-minute drive from the city centre. Inhabited by Portuguese settlers in the 1550s, Macau’s deep-rooted history and heritage is interestingly married with Chinese culture. Chinese temples stand beside neo-classical churches, while lavish casinos tower above Portuguese ruins. Renowned for its fusion of “East-meets-West” flavours, Macau serves up the best in both simplicity and creativity. Indulge in the tastiest dim sum, bacalhau and amêijoas na cataplana, while you must pay a visit to Lord Stow’s Bakery for the original pastéis de nata! Rub shoulders with the rich and famous at the swanky casinos along the Cotai strip. With 5-star hotels and fine-dining restaurants to match, you’ll feel like royalty stepping into one of these palaces. It’s little wonder Macau is the gambling capital of the East! Macau is best visited during the golden autumn months of September to November. Make the most of the city’s outdoor activities with cool temperatures and sunny skies. Summer (June-August) is typically hot and humid with occasional thunderstorms and typhoons hampering your balmy beach days. Winter (December-February) brings festive cheer to the air as locals eagerly gather for Christmas celebrations. This is a fairly busy season, so book accommodation ahead of time. The spring rains and monsoon season occur between March and May but, if you pack an umbrella, you can easily navigate your way around the city. Macau is abuzz with festivals and holidays throughout the year. Some not-to-be-missed events include the Lunar (Chinese) New Year in February, A-Ma Festival in May, International Dragon Boat Races in June and the Fringe Festival in November. For cheap flights to Macau and discounted accommodation, go during summer time! Macau is an eclectic city oozing character, charm and culture, where Portuguese history is nestled inside modern-day China. Macau was one of the earliest European colonies to settle in Asia and the last to be relinquished, in 1999 – as a result this city preserves its distinct European flavour. Macau’s city centre is a UNECO World Heritage Site, steeped in a fabric of rich history. 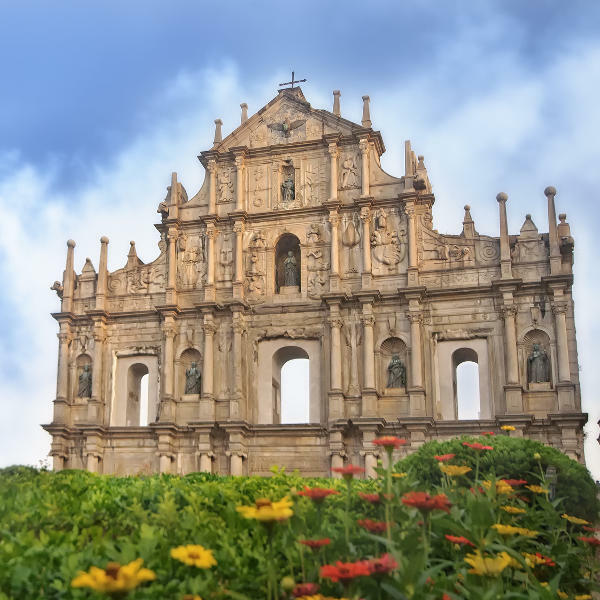 The Macau Heritage Walk circuit is a great way to take in the major historical sites and buildings, like the ruins of St. Paul’s Cathedral, the Macau Museum and Fortaleza do Monte. Senado Square is home to a number of attractions, including Domingo’s Church and the impressive Senate building – a stunning example of Portuguese colonial architecture in 17th-century Macau. Don’t miss out on the finest shopping and dining experiences, showcasing the best in Portuguese and Chinese flavours. Just behind Senado Square you can find the quaint market of Rua de Tercena, selling a variety of weird and wonderful things, including antiques and artworks. The Buddhist relic, A-Ma Temple, is architecturally fascinating with its intricate stone carvings and stunning views over the bay. 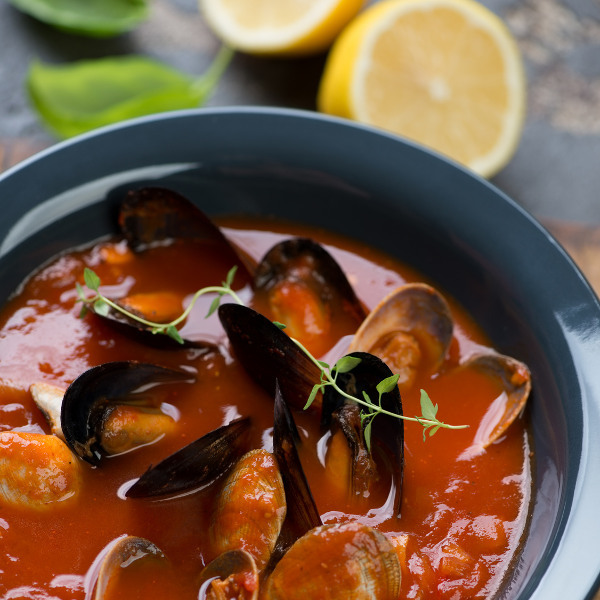 Indulge your fun side at the Fisherman’s Wharf theme park, while the Maritime Museum showcases historical dragon boats, flower boats and fishing smacks used during war time. To the south of the Peninsula lies the cobblestoned island of Coloane with its pastel-coloured churches, eucalyptus groves and sandy beaches of Hac Sa and Cheoc Van, humming with summer activities. For some glitz and glamour, paint the town red along the Cotai strip. 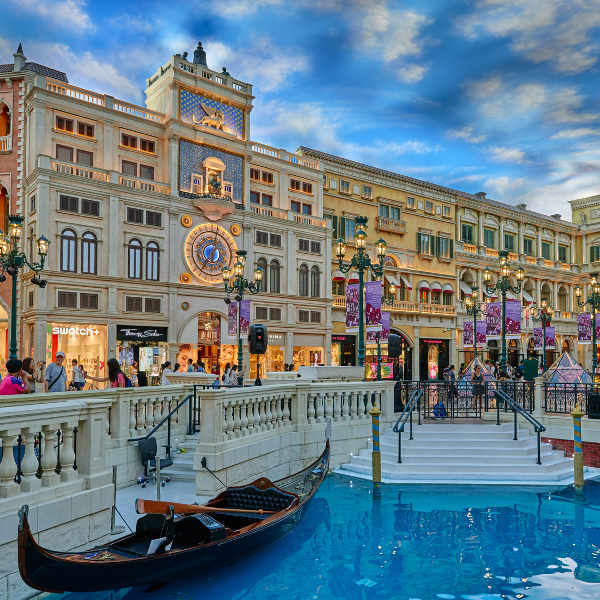 Play your lucky hand at the plush casinos at The Venetian and City of Dreams, with high-end fashion malls and glamorous hotels to match. Whether you’re there to explore the high life, island attractions, incredible cuisine or historical marvels, Macau is the adventure of a lifetime! Compare several airlines, and book your cheap flights to Macau online at Travelstart! Macau is a very safe holiday destination. Tourists should be aware of pickpocketing and street crime in busy areas and take general precautions with valuable belongings. Macau is a world-hub for gambling – be aware that the legal gambling age in Macau is 21 and possession of any illegal substances may lead to imprisonment.